DENVER -- As the House Finance Committee prepared to take up Senate Bill 19-181 on Monday, dozens of city and county leaders are coming together to speak out against it. 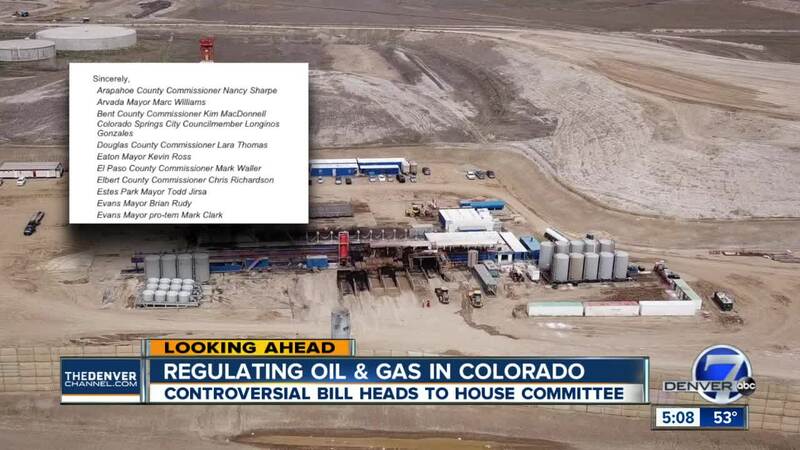 At its core, the bill would change the focus of the Colorado Oil and Gas Conservation Commission (COGCC) away from fostering development and prioritize the protection of public safety, health, welfare, and the environment in regulating the oil and gas industry. It comes just two months after the Colorado Supreme Court ruled in the commission’s favor in Martinez v. COGCC. That lawsuit was brought on by a group of teenagers who sued the commission after asking it to create a rule to make the environment and public health and safety a priority. That’s what SB181 aims to do. The bill already passed the Senate and is now in the House. But while lawmakers debate the merits of the bill, elected leaders from dozens of cities and counties across Colorado are speaking out against it. “It would be disastrous for my city of Evans,” said Mayor Brian Rudy. More than 500 people in the city are employed by the oil and gas industry. “This would be a huge devastation not only to the city but to Weld County in general,” said Mayor Pro Tem Mark Clark. Both Rudy and Clark say they feel like their concerns are being ignored. “We are absolutely being left out of what’s happening on the capitol right now,” Rudy said. On Tuesday, both the City of Evans and Morgan County voted on a resolution to oppose the bill. The two joined a group of 44 other elected officials from Greeley, Grand Junction, Weld County, Rio Blanco and other jurisdictions who penned a letter to Governor Jared Polis expressing opposition to the bill. That letter, which was first obtained by the Greeley Tribune, reads in part, “Senate Bill 181 is especially troubling, as it singles out a single industry and could make it prohibitively difficult for many operators to continue working in our state." The letter cited a study released by the REMI Partnership that said the bill could cost Colorado 120,000 jobs and $8 billion in state and local tax revenue by 2030. “It is our financial, moral, and local duty to defend the abundant opportunity that this industry provides to the people who call our communities home,” the letter reads. Meanwhile in Adams County, after hours of public testimony on Wednesday, commissioners voted unanimously to place a moratorium on new oil and gas drilling permits to give lawmakers time to vote on SB181. The moratorium will last days. While the House Finance Committee gets ready to consider the bill, Clark says he just want legislators to take their concerns into consideration. “We’re trying to say, ‘Hey, wait, slow down. Let’s take a step back and let’s hear what the people want,'” he said. SB181 will be heard in the House Finance Committee at 1:30 p.m. on Monday.